Lydia Dacorte of Wheaton College competes in the 500-yard freestyle on Wednesday at the NCAA Division III championships in Greensboro, N.C. The Mount Desert Island swimmer finished fourth to earn All-America honors. 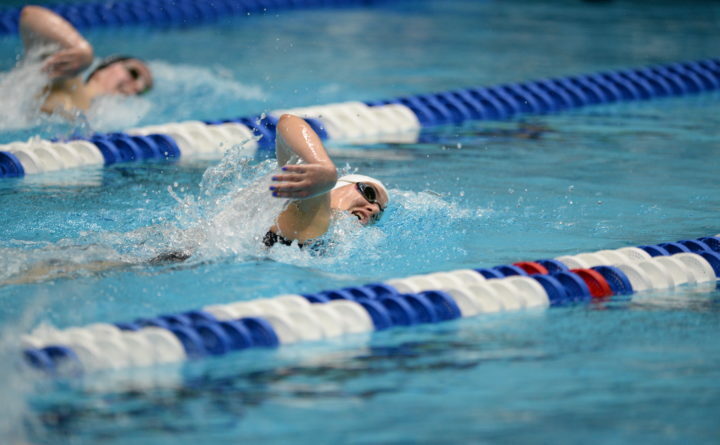 Lydia DaCorte, swimming for Wheaton College, placed fourth in the 500-yard freestyle on Wednesday at the NCAA Division lll Swimming and Diving Championships in Greensboro, North Carolina. The former Mount Desert Island High School standout posted a time of 4 minutes, 51.6 seconds, after swimming a 4:45.7 in the trials. DaCorte’s time was a school and New England Women’s and Men’s Athletic Conference record. DaCorte finished a half-second behind bronze medalist Kendall Vanderhoff of Kenyon College and earned All-America honors. DaCorte, who previously was named the Women’s Swimmer of the Year, becomes only the second Wheaton swimmer to become an All-American. Also on Wednesday, Bowdoin College senior Sterling Dixon placed seventh in the women’s 200 individual medley at 2:03.7 and the 200 medley relay unit from Bates College finished eighth at 1:44.2. The championship meet runs through Saturday. The NCAA Division I championships are being held this week in Austin, Texas. There, Caitlyn Tycz of Brunswick will race in the 100- and 200-yard butterfly events. The University of Southern California sophomore finished seventh in the 100 butterfly at 52.47 earlier this month at the PAC 12 Championship, where she won the consolation of the 200 butterfly with a 1:55.59. Leila Johnston, who also swam at MDI, split a 23.5-second butterfly leg on Florida State University’s third-place 200 medley relay (1:36.2) at the Atlantic Coast Conference Championships. The Seminoles’ relay qualified for the NCAA championship and also will race in Austin. This story was corrected at 9:35 a.m. on March 25, 2019, to reflect the correct spelling of Lydia DaCorte’s last name.